Dr. Toy's, NAPPA Gold and All-Star from Kids First! Unfortunately, Backyard Enterprises and Fox Home Video have chosen to discontinue the video Baby Songs Silly Songs. 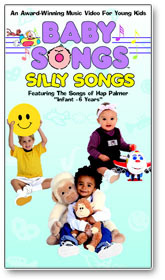 Three of the songs from Baby Songs Silly Songs have been included in current DVD programs. "Touch You Toes To Your Nose" and "So Happy You're Here" are now part of the DVD Baby Songs Original. "Five Little Monkeys" is included in the DVD Baby Songs ABC, 123.Troy, MI (October 25, 2001)---Baby Songs Silly Songs, featuring singer/songwriter Hap Palmer, a pioneer in integrating music and movement in early childhood education, has won awards from several organizations that recognize the very best in children's entertainment and educational products. Kristin Sands, senior brand manager of Anchor Bay Entertainment former distributor of the very popular Baby Songs series, announced today that Baby Songs Silly Songs was named one of Dr. Toy's 10 Best Audio/Video Tapes for 2001 and one of Dr. Toy's 100 Best Children's Products for 2001. The programs focus on unique, high quality, educational, creative and active products in cooperation with the Institute for Childhood Resources, established in 1975. The video also received the National Parenting Publications Gold Award (NAPPA), produced by United Parenting Publications. Gold Award winners are featured in 54 regional parenting publications across the nation, representing a monthly readership of more than six million parents. United Parenting Publications launched NAPPA ten nine years ago to recognize the best in children's toys and media. Baby Songs Silly Songs received the All-Star rating from Kids First!, a program of the Coalition for Quality Children's Media. Founded in 1991, the Coalition for Quality Children's Media (CQCM) is a national not-for-profit organization that is a voluntary collaboration between the media industry, educators and child advocacy organizations. The mission of CQCM is to enhance children's viewing experiences by making quality children's media more visible and more readily available. All-Star rating is the highest rating a program may achieve. Featuring seven all-new tunes and three Baby Songs classics by children's music legend, singer/songwriter Hap Palmer, Baby Songs Silly Songs demonstrates Palmer's pioneering techniques of integrating music and movement into preschool education while celebrating a child's natural enjoyment of silly situations and wordplay. The ten songs on the 30-minute Baby Songs Silly Songs, recommended for ages 2-6, features scenes of real children acting silly and singing along and are chock full of activity ideas that are as educational as they are fun. The video retails for $7.98. Educators, child care providers, and parents recognize Baby Songs as age-appropriate, quality entertainment for young kids. Parents' Choice called Baby Songs "a tried and true kid-vid classic," and two of the videos received its prestigious Gold Award. The videos have also garnered wide, critical acclaim from TV Guide (Best Kid's Videos), The Wall Street Journal, Parents Magazine and People, among many others.Baby Songs Silly Songs and other Baby Songs videos, are available from Hap-Pal Music. The brainchild of Amy Weintraub and Brooks McEwen, Baby Songs was a runaway bestseller in its first release, with more than 2 million sold. Now there are 10 titles available to own. Each Baby Songs video features a unique mixture of fun, upbeat original sing-along songs, brightly colored animation, and live-action scenes from the everyday lives of children.Palmer's songs enhance the development of motor skills, language acquisition, reading readiness, and math concepts as well as nurture the imaginative process and encourage creative problem-solving. His widespread popularity in schools and day-care centers for more than thirty years, has made him a living legend within the teaching community.